N. D. Paige, Before Fiction. The Ancien Régime of the Novel. Compte rendu publié dans Acta fabula : "Roman & réel aux XVIIe & XVIIIe siècles : un problème d’histoire littéraire" par François-Ronan Dubois. Nicholas D. Paige, Before Fiction. The Ancien Régime of the Novel. Philadelphie : University of Pennsylvania Press, 2012. Fiction has become nearly synonymous with literature itself, as if Homer and Dante and Pynchon were all engaged in the same basic activity. But one difficulty with this view is simply that a literature trafficking in openly invented characters is a quite recent development. Novelists before the nineteenth century ceaselessly asserted that their novels were true stories, and before that, poets routinely took their basic plots and heroes from the past. We have grown accustomed to thinking of the history of literature and the novel as a progression from the ideal to the real. Yet paradoxically, the modern triumph of realism is also the triumph of a literature that has shed all pretense to literalness. 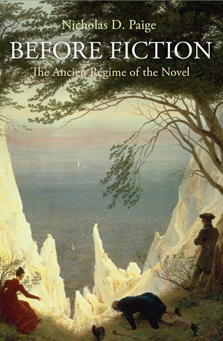 Before Fiction: The Ancien Régime of the Novel offers a new understanding of the early history of the genre in England and France, one in which writers were not slowly discovering a type of fictionality we now take for granted but rather following a distinct set of practices and rationales. Nicholas D. Paige reinterprets Lafayette's La Princesse de Clèves, Rousseau's Julie, ou la Nouvelle Héloïse, Diderot's La Religieuse, and other French texts of the seventeenth and eighteenth centuries in light of the period's preoccupation with literal truth. Paige argues that novels like these occupied a place before fiction, a pseudofactual realm that in no way leads to modern realism. The book provides an alternate way of looking at a familiar history, and in its very idiom and methodology charts a new course for how we should study the novel and think about the evolution of cultural forms.